The seamless multichannel experience. We’ve heard about it, read about it and, for a lot of retailers, probably spent nights dreaming about it. We know how important it is to get it right. But what does it mean for the bricks and mortar retailer and what are the implications for store planning and design? As the multichannel retail world continues to develop, the bricks and mortar store is no longer seen as the dying relation of its online retail cousin. Indeed, an increasing number of pure play retailers, such as Simply Be and Jacamo, are opening bricks and mortar stores, having recognised the importance of a physical presence in the overall brand offering. In this model, the brand projects a clear, identifying message – “this is who we are” – and becomes an umbrella for the full and diverse range of positive shopping experiences offered according to the strengths of the particular customer contact point (whether that be on the company’s website, on the telephone, through a mobile or in-store). However, while retailers are taking huge strides in the right direction, ‘seamlessness’ is not yet a reality. Creating ‘one brand, one mind, countless experiences’ relies on the coming together of three key elements – consistency, simplicity and personalisation – and for many in retail, this is presently a work in progress. Of the three elements, consistency is perhaps the biggest issue. Many retailers are struggling to introduce and maintain true consistency, even some of the biggest, most well-known brands. Take vouchers or product returns, for instance. There are still numerous examples of retailers offering vouchers only redeemable either in-store or online, and customers making purchases online may find that they are thwarted when they attempt to return the item to the retailer’s store. So what can store retailers do to promote, ‘one brand, one mind’ consistency? Of course, following the same policies and procedures and being able to respond to online customers in the same way as those shopping in-store is essential, whether that relates to pricing, special offers, use of vouchers, guarantees, orders or returns. Retailers such as Cath Kidston, Tesco and John Lewis are taking the lead in this respect. Cath Kidston, for example, has introduced a gift card, usable both in-store and online, which enables customers to spend, top up and check balances, whenever and wherever they choose to shop with the brand; Tesco uses SMS to send personalised offers directly to customers’ mobile phones which can then be applied in-store; while John Lewis enables customers to collect and return online orders in both John Lewis and Waitrose stores. Consistency, however, proves impossible if the design and layout of the store is not conducive to maintaining the same level of efficiency as the online experience, or if the brand image it presents is very different to that presented online. 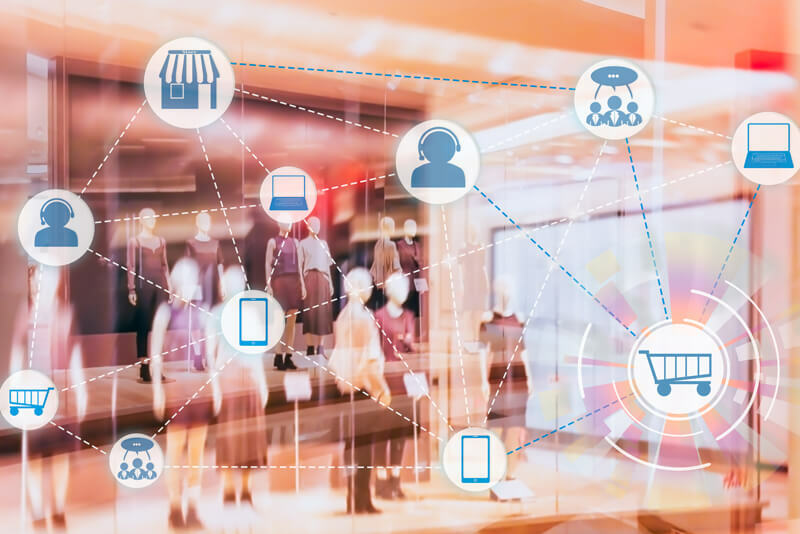 A study entitled, ‘Customer Desires Vs Retailer Capabilities: Minding the Omnichannel Commerce Gap’ found that the majority of today’s empowered shoppers (71% to be exact) expect to be able to view in-store product availability via the web. To make this an efficient reality, like Top Shop and Dune, retailers need to review their existing store environment and operations and implement real-time task management systems alongside well thought out counter design and back of house storage. Moderate changes like these will enable a swift and accurate stock inventory, as well as being able to process customer orders as quickly as possible. It works the other way around too. Installing customer order kiosks in-store and providing staff with tablet technology enables customers to learn about stock availability online and allows them to place an order via the store if that is more convenient for them. Understanding your customer’s journey through store and her key shopping missions must form the basis of any store design plans so that your customer can quickly find where she wants to go, achieve her mission and then potentially browse other areas of your store, relaxed and happy. The strategic use of furniture, flooring and lighting can guide your shopper easily through the store while clear signage is a top priority. Selfridge’s has mastered wayfinding signage in a beautiful way. Not only is their signage pleasing on the eye and a perfect reflection of the Selfridge’s brand, but it also works both for those shoppers with little time to spend in-store as well as for those with more time to consider the finer detail. The tone of voice used in signage must also be consistent with the online voice (and vice versa) in order to portray the brand as it is intended. Innocent, Apple and John Lewis are three retailers considered to have got their tone of voice right. Matalan, recognising the importance of finding a consistent tone of voice, appointed a language consultancy to help them implement a tone of voice which connected with their target customer. Previous signage, such as, “just arrived” and, “fitting rooms,” were changed to, “I’m new” and “try on”. In-store efficiency goes hand-in-hand with simplicity and convenience. Shoppers want streamlined services that save them time and avoid frustrations, but implementing ‘simplicity’ in-store isn’t necessarily as easy as it appears and requires a new way of looking at store planning and design to achieve maximum functionality alongside aesthetically pleasing design. Waitrose is one store that has got it right. It has replaced its customer service desk with a neatly designed, strategically placed welcome desk at the front of its store which brings together in one place a range of value adding services. The desk serves both as a collection and returns point while also offering a range of convenient services such as dry cleaning, gift wrapping, ordering of celebration cakes and the ability to purchase online via in-store tablets. The location also provides an opportunity for employees and the brand to connect with customers immediately upon entry into the store, making the customer feel welcome and promoting a level of customer service which, until now, has been reached predominantly by online retailers. Indeed, with a myWaitrose card, customers can even pick up a free cup of coffee at the welcome desk. Alongside other major brands such as Tesco, Waitrose is also presently trialling new geolocation technology in order to make the process of click and collect even simpler. The retailer is testing the use of Apple’s iBeacon technology for identifying registered click and collect customers as they enter the store, with the purpose of allowing even faster retrieval of ordered goods. And fashion retailers, such as House of Fraser, are presently trialling Iconeme beacon technology, which works in conjunction with the retailer’s own app, to provide product information to customers on their mobile phone. The system works through ‘beacon-enabled mannequins’ which recognise the approach of a customer and send information, such as product description and price details, direct to the customer’s mobile device. Perfect examples of the frustration felt by customers when technology doesn’t behave as it’s supposed to can be seen in the use of in-store self service kiosks and tills. It is not uncommon for a self-service kiosk to run out of paper, leaving the customer without a receipt and feeling vulnerable; likewise, when an item will not scan at a self-service till the customer may become annoyed, or perhaps worse still, embarrassed, if there is a queue of people waiting behind her. This is not how retailers would like their customers to leave the store! But technology is without doubt a force for the good in retail and where it particularly excels is in its ability to offer personalisation to customers – and it goes without saying that true personalisation relies on consistency and simplicity for the best possible experience. Personalisation demonstrates the brand’s commitment to its customer and its recognition of each customer as an individual. Boots, for example, has introduced a new app, designed to work with its Advantage Card, which enables the retailer to provide customers with individual offers based on their shopping habits, and which customers can access via their mobile phone, online or in-store at the Advantage Card kiosks. Today’s empowered customer expects speed, convenience, efficiency, individualisation and the ultimate positive experience – a hefty task but far from impossible with the emergence of new technology and a changed, creative approach to retail. The ‘one brand, one mind, countless experiences’ dictum responds to these 21stcentury shopping requirements, bringing the retailer and the customer fully together under one umbrella through consistency, simplicity and personalisation.